Oh Connie! I LOVE THIS!!!! So cute and fun and the sentiment is perfect. 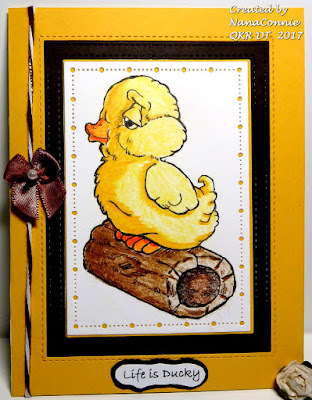 Love your coloring on the little duck and the design is fabulous. Clean and simple and yes, perfect! Love it! Hi Connie, I hope you are well. This is a gorgeous card and I just love the cute chick. Beautiful colours too. Have a wonderful weekend. Super cute, and so beautifully coloured! Thank you for sharing your gorgeous card with us at Stamping Sensations. As cute as can be Connie. Love this image and I, too, like the use of two different mediums for your coloring. Wishing you a good weekend. So sweet, I love the look on the duck's face. Gorgeous colouring, I've never thought of combining markers with pencils. Is it wrong of me to say this is just "ducky?" Such a cute image and the coloring very rich looking. Thanks for sharing on the PIP challenge this week. Oh isn't this just the cutest duck and what a fabulous masculine card!I love how you coloured the image! Oh he is a little sweet pie - he looks all contented sitting on his log. GREAT image and your colouring is great AGAIN. Love the card. Really cute card! Thanks for sharing at Quirky Crafts.